Tehran International Tower (Persian: برج بین‌المللی تهران‎) is a 56-story building in Tehran, Iran. It is the tallest residential building in Iran. It is located north of Yusef Abad and Amir Abad districts, close to Kordestan and Resalat Expressways. Structural Towers consists of walls of reinforced concrete sub and ceilings as well as a slab of concrete design and are made with concrete wall core along the three wing angle 120 degrees from each other. Also the walls have subsidiary design and the main walls are perpendicular. Additional pieces of the original structure and design of this tower are based on safety standards. Garages as well as concrete structures and retaining walls are designed and implemented in this Tower. The Tower also has Intelligent control system including internal computer network, energy management, network control, CCTV cameras, fire systems, control systems and traffic control. Tehran International Tower was built in three separate wings. A north wing is A. B is the East Wing. The West Wing is C. Each wing has a different view. The height of each floor is 3 meters. The cross-shaped tower is filled with stars at angles. Tehran International Tower is one of the most expensive residential buildings in Tehran with excellent transport links to the main motorways. 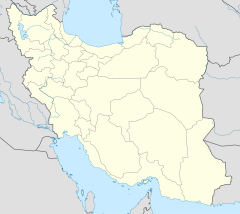 ^ "نگاهی به برج‌های معروف تهران" (in Persian). This article about an Iranian building or structure related topic is a stub. You can help Wikipedia by expanding it.